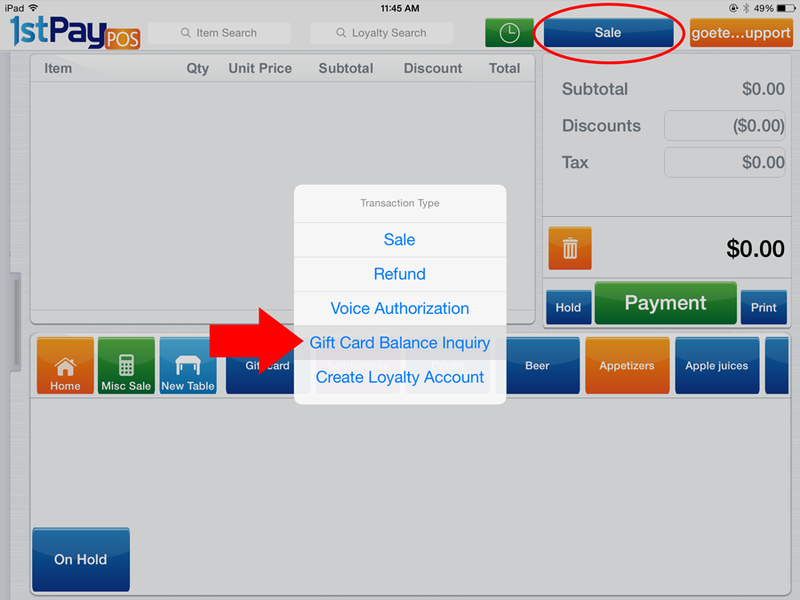 The option to take gift cards on a 1stPayPOS iPad POS system is available when it is enabled on the account. 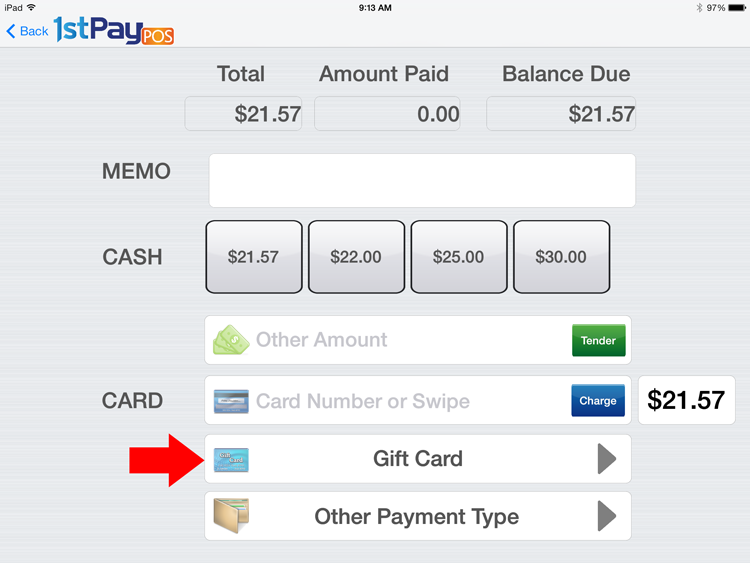 Your sales office would have to add the gift card option to each 1stPayPOS MID that requires it. Log into the 1stPayPOS Portal. 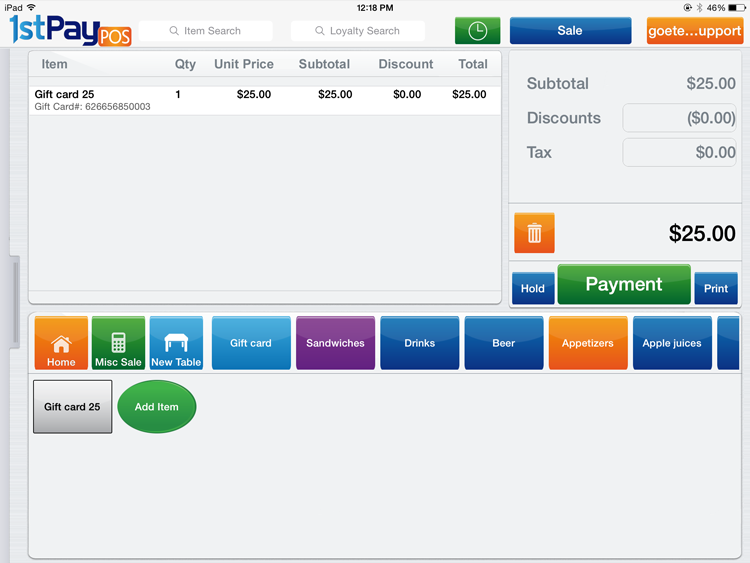 This can be done from the 1stPayPOS app by tapping the tab on the left to open the menu and selecting Go to Portal, or from the computer by logging in here, and selecting 1stPayPOS from the Product Hub. Select the Inventory tab from the top menu. You will be brought to the Add Item screen. Enter product information, such as $25 Gift Card, and assign to a category. For more information about adding an item, see here. If the Gift Card is for a set amount, enter that amount in the Price field, such as $25. If it is a custom amount gift card, enter 0.00 for the Price, and then you will have the ability to enter the gift card amount from the app when it is purchased. Check off the checkbox next to "Gift Card: Yes (Is this Item a Gift Card?)". 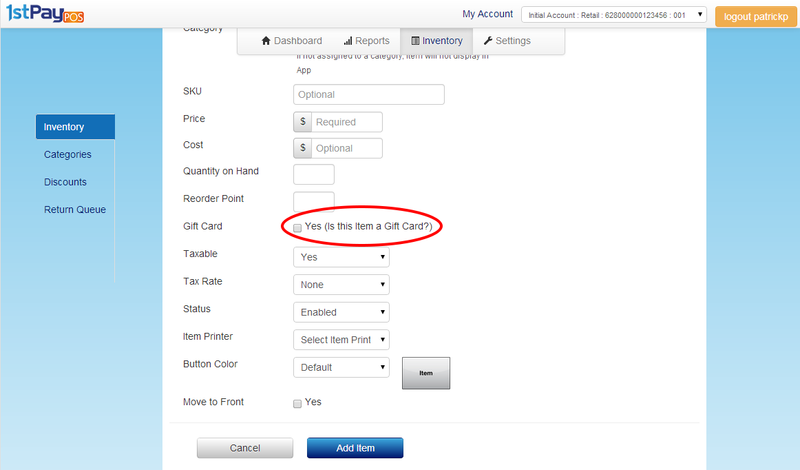 Because tax is disabled for gift cards, the ability to set a tax rate will disappear upon clicking the checkbox. When you have finished configuring the gift card, click Add Item. Select the Gift Card item you created in the POS Portal. 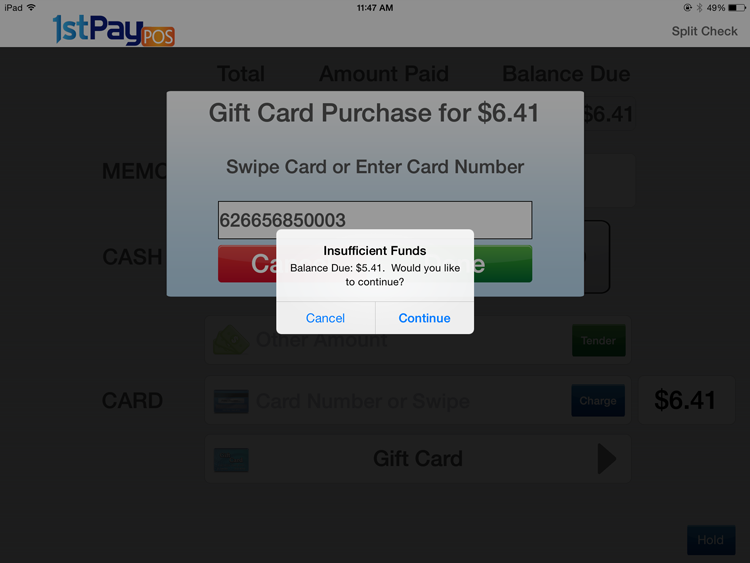 You will be prompted to swipe or manually enter the gift card number. Do so and tap Done. If it is a custom amount gift card, you will be prompted to enter the dollar amount to be placed on the card. Enter this number and tap OK.
For gift card activations and reloads, the receipt will show the full gift card number and the amount put on the card for the activation/reload. A separate small receipt will also print with the full gift card number and amount put on the card for the activation/reload. Select the Gift Card item you created in the POS Portal. You will be prompted for the gift card number to be reloaded. If a valid gift card number is entered, it will add the reload to the order and the rest of the order can be completed normally. Tap on the 'Sale' button on the top right hand side. You will be presented with the following options: Sale, Refund, Voice Authorization, Gift Card Balance Inquiry and Create Loyalty Account. Select 'Gift Card Balance Inquiry'. You will be prompted for the card number. 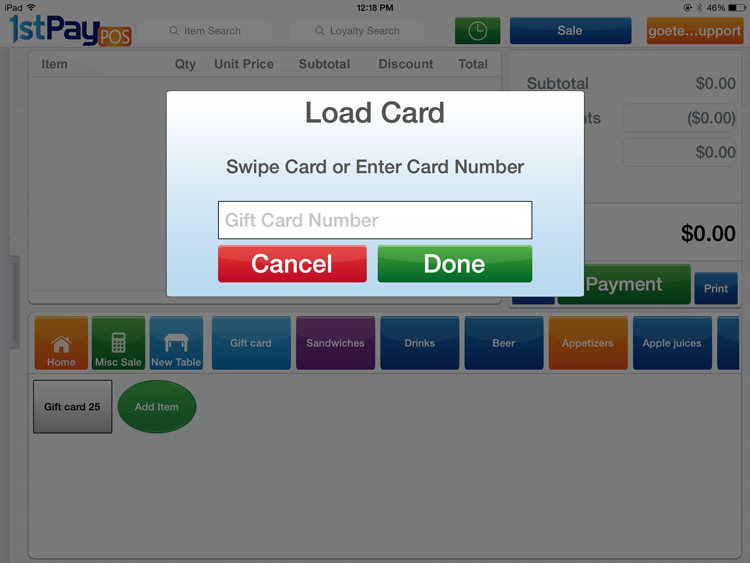 You may enter it manually or swipe the gift card (the app will accept the swipe so long as the box is displayed and the swiper is configured). If the card number is valid (meaning it is active and properly attached to your 1stpaypos account), it will display the balance on the card. NOTE: This assumes that Gift Cards and Loyalty are an option on the account. If this is not the case, this would need to be added by your merchant services provider/sales office. Create an order for a customer as you normally would. 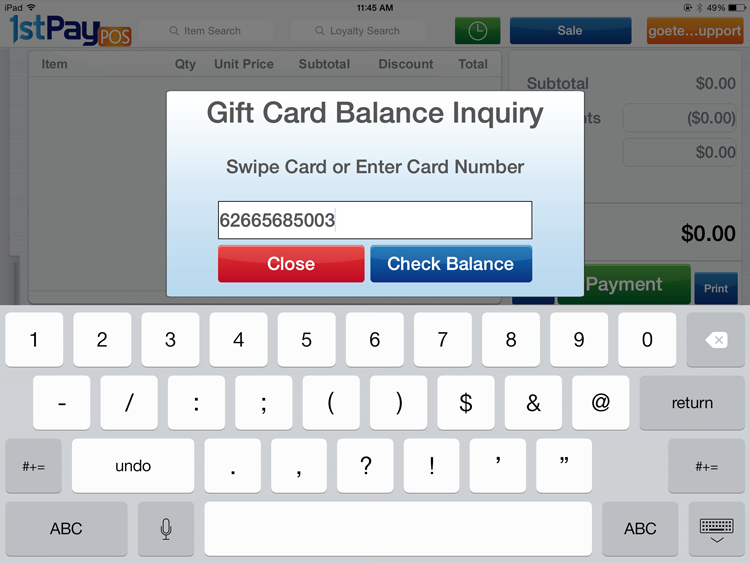 From the Payment Screen, you will see a Payment Type called "Gift Card" below the credit card field. Tap Gift Card. The app will prompt you for the gift card number. You may key it in manually or swipe the card (while the box asking for the card number is displayed). If the card number is valid, it will be accepted. If the gift card does not have sufficient balance, it will ask you to 'continue' or 'cancel'. Cancelling ignores the attempt to use the gift card for payment and takes you back to the Payment Screen with the full balance of the order remaining. Continuing will take you back to the payment screen to select a new form of payment to pay for the remaining balance that the gift card could not cover ("Balance Due"). If the card has a sufficient balance, it will be accepted as payment just like any other form of payment. Complete the sale as you would for a regular transaction. For purchases made with a gift card, receipts will show the last 4 digits of the gift card number and Available Balance.